Embarking on new avatar technology to bring spirit Ariel to life, this cutting-edge production by the Royal Shakespeare Company (RSC) feels as though it is changing theatre forever. 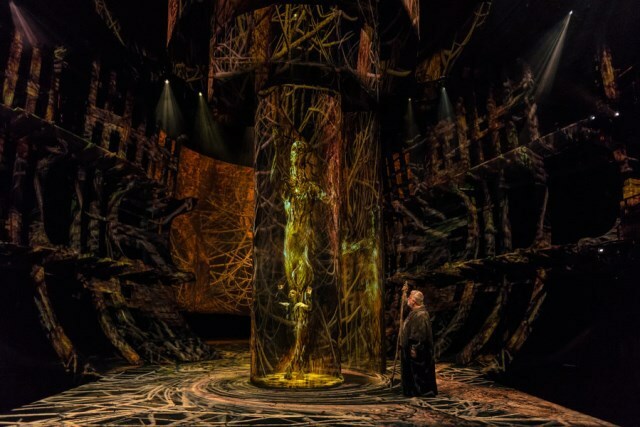 Merging cinematic theatrics with ground-breaking stage effects, this new version of The Tempest from RSC artistic director Gregory Doran brings a multi-dimensional, more sensory experience to the theatre. Could this be the future of all stage productions in years to come? It opened at the Royal Shakespeare Theatre in Stratford upon Avon in November and continues there until January 21, 2017, before transferring to the Barbican in London next summer for a seven-week season. Shakespeare's The Tempest is perfectly suited to this technology (provided by Intel and The Imaginarium Studios) as it is set on a magical island inhabited by spirits. Mark Quartley, as loyal spirit Ariel, is kitted out in a sensor-equipped body suit that picks up on his every move and expression, transforming them into an ethereal, blue glowing computer-generated character floating above Prospero at key points in the play (pictured below). It's in a similar vein to the motion-capture technology used by actor Andy Serkis to create Gollum in The Lord of the Rings films. Quartley is a beguiling and agile Ariel, playing him with a touch of vulnerability and emotional insecurity. 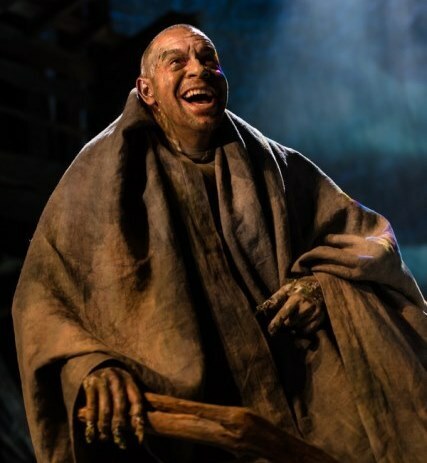 He has a touch of the elfen about him and his scenes with Prospero are the most emotional in the production. Their relationship is portrayed tenderly, like father and son, with Prospero physically breaking down when Ariel asks him "Do you love me?". 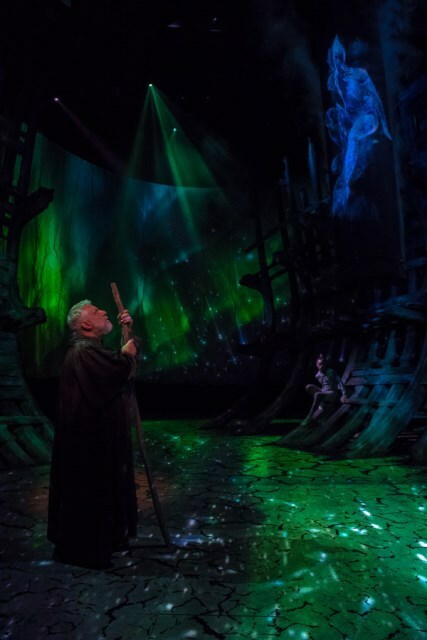 After a 20 year break, Simon Russell Beale returns to the RSC to play a fairly gentle, sensitive version of Prospero in the play widely regarded as one of Shakespeare's best. 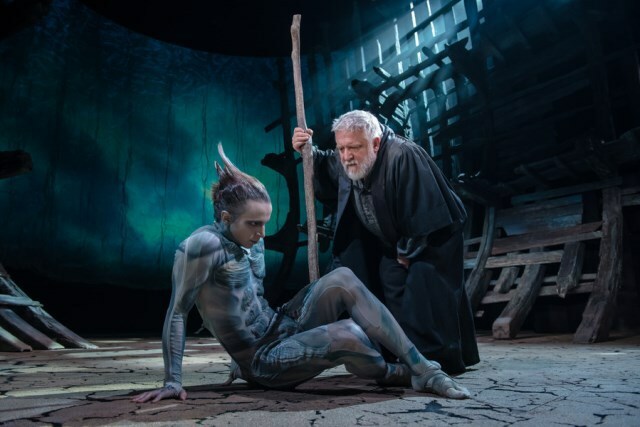 Slow to get going, much of the first 20 minutes is bringing the audience up to speed on the backstory with little action as Prospero explains to his daughter Miranda how his brother and colleagues usurped him from power and set them adrift at sea. Surviving by chance to land on a magical island, Prospero is able to acquire the power of sorcery and years later has created a tempest to shipwreck the men who betrayed him and bring about their come-uppance. The set is shaped like the inside of a huge ship but is easily transformed with impressive digital technology and lighting from within cracks in the floor. From below these cracks appears slave Caliban. A towering beast who is wonderfully dopey yet endearing. Although far too dim-witted for Prospero, he somehow makes you back the underdog with his slow mannerisms and silliness when drunk. Joe Dixon does a wonderful piece of character acting, bringing this down on his luck monster to life. What really adds zest to the production is Dixon's lively chemistry with Tony Jayawardena and Simon Trinder, playing jokers of the pack Stephano and Trinculo. The three of them bring a pantomime style hilarity to the performance and lifts it whenever they appear. Their light storyline balances well with the darkness of Prospero's plot of revenge. Despite some fine acting though, it's ultimately the special effects that steal the show. They dazzle to such a degree that I wonder whether these cinematic tools are distracting too much away from the simple beauty of the language and acting. Interestingly, there's a nod in this production to the 'masques' from the court of King James I, when new elaborate theatre techniques, lighting and scenery were seen as cutting edge of the time(1603) but paved the way for theatre as we know it today. So, on the 400th anniversary of William Shakespeare's death, maybe this is the time to embrace the changes in technology and how it can enhance his work to refresh it for another 400 years to come. There's no doubt that this new Tempest is a spectacular, ground-breaking production - and it's also moving the goal posts for theatre.